The general condition of your cat’s skin and coat are good indicators of its health. Although health and nutrition influence the luster and texture of your cat’s coat from the inside, regular grooming and skin care on the outside will help keep your cat’s coat clean and free of tangles, no matter what type of hair coat he or she has. What are the different types of hair coat that a cat might have? With selective breeding, man has developed breeds of cats that range all the way from hairless Sphinx cats to fluffy long-haired breeds. Some cats shed very little, such as the Sphinx and the Rex breeds. The majority of other breeds of cats have a smooth outer coat of ‘guard hairs’ and a fine undercoat of soft hairs that provide additional insulation. Long-haired breeds of cats often have very fine silky outer coats that may tangle very easily. Some cats that live in cooler climates, particularly if they venture outdoors, will undergo two heavy seasonal shedding cycles per year (late spring and late fall), during which much of the undercoat falls out in clumps. However, many cats that share our homes shed their undercoat and guard hairs in low levels all year round. All cats benefit from regular brushing to remove loose hairs and dead skin cells, to keep the coat free of dirt, debris, and external parasites, and to distribute natural skin oils along the hair shafts.Cats with long, silky or curly coats require daily brushing to keep their hair from becoming tangled or matted, especially around the ears, in the armpits, or along the back of the legs. Cats with short hair coats may require less frequent brushing. Daily brushing will cut down on the amount of hair that a cat swallows during the course of self-grooming with its tongue, thus helping to reduce the number of hairballs your cat may develop. In addition to benefitting your cat, daily brushing will cut down dramatically on the amount of loose hair and pet dander floating around the home. For some people with mild cat allergies, daily brushing may even reduce the amount of airborne allergens enough that they can share their home with a cat. Regardless of the type of hair coat, you should inspect your cat’s coat every day to make sure there are no tangles or clumps that have developed under the armpits, in the groin, or behind the ears. If you regularly check your cat’s coat and skin, you will also have a better chance of detecting any unusual lumps, bumps, or areas of sensitivity on your cat’s body at an early stage. Different styles of brush work better on certain types of hair coats. Stiff bristle brushes will help remove loose hairs from cats with short coats or sparse undercoats, while long-toothed metal combs or brushes, especially ones with rows of offset tines, are useful to remove loose hair and smooth minor tangles in medium and long-haired cats. Combs such as the one pictured to the left of the illustration work well to remove clumps of loose undercoat if your cat is undergoing a heavy seasonal shedding, or for gently teasing out smaller mats behind the ears or along the back legs of long-haired cats. Whatever the choice of brush you use, it is important to be gentle when using it, and to avoid excessive pulling on tangles. Our veterinary health care team may be able to give you specific recommendations for a grooming tool that could work particularly well for your cat’s type of coat. How should I remove tangles, mats or burrs? If a tangle is small or relatively minor, or if your cat has just picked up a burr or grass awn, you may be able to gently remove it by brushing or combing it out. If, however, the tangle is extensive or there is a large clump of burrs or grass awns forming a mat, it may be necessary to cut out the clump of hair. In this case, you need to be extremely CAREFUL that you do not accidentally cut your cat’s skin. When tangles are severe or extensive, we strongly recommend that you seek professional care, either from a groomer or from your veterinarian. If a mat has caused any sort of skin irritation, you should take your cat to the veterinarian so that the appropriate treatment can be prescribed. If you are planning on bathing your cat, make sure that you brush out as many burrs or tangles from the coat BEFORE bathing, since tangles can become impossible to remove after a bath! 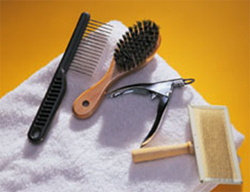 Most healthy adult cats are fastidious groomers and rarely require a bath. How often your particular cat needs to be bathed will vary somewhat with its age, lifestyle, and underlying health status as discussed above. For example, an older, arthritic cat that has difficulty grooming itself may need the occasional bath to remove loose hair and objectionable odors. If your cat has allergies, your veterinarian may prescribe frequent bathing as part of the treatment regime. 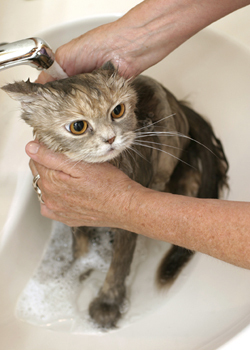 If you find that your cat requires frequent bathing, you should discuss this with your veterinarian, who may recommend the use of a ‘dry shampoo’ or a special shampoo and conditioning rinse so that your furry friend does not develop skin problems associated with the repeated baths. No. Cats should only be bathed in a shampoo that is formulated for use on cats – their skin has a different thickness and pH than human skin, and human shampoo, including baby shampoo, is too harsh for their skin. For routine bathing, a hypoallergenic shampoo without any added perfumes is the best choice. How should I bathe my cat? Bathing cats can represent a big challenge to many cat owners, because few cats enjoy the experience. If you have a new kitten, you can teach it to tolerate baths by starting when it is young, but it can be difficult to train an adult cat to accept bathing as part of its grooming rituals. Many people choose instead to take their cat to a professional groomer for bathing, or to arrange with their veterinarian to have the cat sedated and groomed at the veterinary clinic. If you are going to attempt to bathe your cat on your own, the bath water should always be warm, partly for the comfort of the cat and partly because shampoos clean more effectively in warm water. Most people find that the easiest way to bathe their cat is in the laundry tub, bathroom sink or tub. Since few cats will sit still in a sink full of water, some groomers recommend ‘dipping’ the cat into the water to wet it down, then applying the shampoo and lathering it up while the cat is on ‘dry ground’. Ideally, you should rinse off the shampoo or other products using running water, but many cats become frantic when put under a stream of water. If this is the case with your cat, you may find it easier to dip it into the water until all the soap is removed. When dipping a cat into water, it is important to hold onto all 4 feet so that it can’t escape AND make sure you guard against personal injuries from teeth or nails! After you have applied the shampoo, work it through the entire coat to remove all dirt and debris. Some owners of cats with particularly thick coats find that it is best to dilute the shampoo in some water so that it is easier to apply and rinse out. For routine bathing, you can rinse the shampoo out right away, but if you are using a medicated shampoo, it must be allowed to sit on the coat for 5-10 minutes before being rinsed out. Make sure you read the instructions on the shampoo label for the specific product that you are using, or follow your veterinarian’s directions if you are using a medicated shampoo. Once the shampoo has done its job, it must be completely rinsed out. For best results, a conditioning product should be applied afterwards, to restore any lost moisture to the skin and minimize the development of dandruff after the bath. Since your cat WILL groom itself vigorously after the bath, it is important to rinse out all traces of shampoo or other products. This is even more important if you are using a medicated shampoo or a flea shampoo, to avoid any risk of toxicity to your cat. Should I have my long haired cat shaved down in the summer? Most cats, even those with long hair, cope very well with hot summer temperatures without the need for a haircut. However, long-haired cats that are prone to getting large mats in their fur, or cats that don’t groom well and object to regular brushing may benefit from having their hair shaved down periodically. In the majority of cases, the cat will require sedation during this procedure, since few cats will tolerate the noise of the clippers or the discomfort of extensive mat removal while awake and alert. If your cat requires a haircut in the summer months, it should be done before the temperature becomes too high, so that the exposed skin does not become damaged from sunburn. 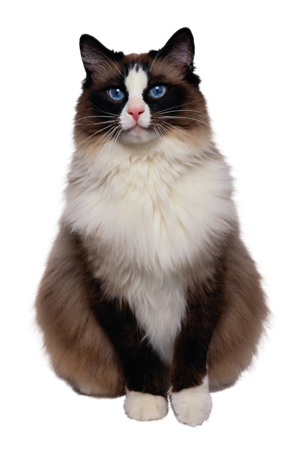 Your take home message is that your cat’s general coat appearance may be the first indicator of health problems. A healthy animal will not shed excessively and will have a shiny coat that is free from dandruff or greasiness. Before reaching for the bottle of shampoo, think about whether that lackluster coat could be telling you something else. If you have any concerns, contact our veterinary clinic to arrange for a consultation.